Naturally housewives in the 18th century needed an array of equipment for their work just as we do, and today we’re going to take a look at the tools the colonial cook had at her disposal to make her work easier. Back then all cooking was done over the fire, and because it was inconvenient and time consuming to kindle a fire from scratch, a good cook never let hers go out. At the end of the day she would rake the hot coals into a pile and either bank them beneath a covering of ashes or cover them with a brass or copper device called a curfew, which would be pushed to the hearth’s back wall for the night. In the morning the embers were raked out and the fire built up. The illustration at right shows 2 English curfews, a fire fork, and a blowing tube—a long iron pipe that’s used as a bellows. Other indispensable fireplace tools included shovels and tongs. the fireplace for cooking rather than a single large fire, much in the same way we use adjustable settings on our ranges for boiling or simmering foods today. For cooking at lower temperatures small piles of live embers were raked onto the hearth at the front of the fireplace. These were used for broiling on a gridiron, frying in a pan, and baking in a kettle. 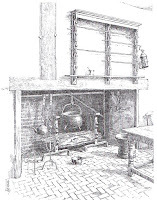 For cooking at higher temperatures, the cook hung larger pots on a crane mounted inside the chimney. 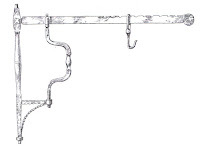 These might be simple iron bars running the length of the fireplace. More desirable, if you could afford it, was a crane that could be swung out from the fire so the cook could check on the contents of the pots without getting scalded by the heat. She could suspend several pots at different points with pot hooks, trammels, or chains and control cooking temperatures by raising or lowering the pots or moving the crane outward. The basic equipment all kitchens had to have included one or more cast iron pots, a baking kettle, and a simple spit for roasting meat. More prosperous households had a wider variety of items for creating more elaborate dishes. Iron pots of different sizes, a long iron fork to remove items from boiling water, an iron hook with a handle to lift pots from the crane, a large and small gridiron with grooved bars and a trench to catch the grease, a bake kettle, two skillets of different sizes, a skimmer, skewers, a toasting iron, large and small tea kettles, a spider (flat skillet) for frying, a griddle, a waffle iron, tin and iron bake and bread pans, two ladles of different sizes, and two brass kettles of different sizes for soap boiling were among items recommended in A Treatise on Domestic Economy for the Use of Young Ladies at Home and at School by Miss Catharine Beecher, published in 1842, a list that would certainly have applied to the 1700s as well. 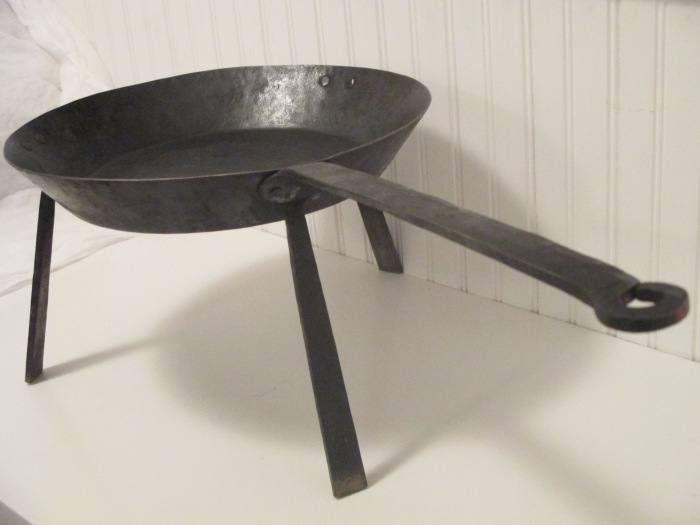 Around 1725 pots, pans, and skillets began to be manufactured in the colonies. A pot is a vessel that has rounded sides and a cover, while a kettle has sloping sides and no cover of its own. Very large kettles, called cauldrons, were made of copper, brass, or iron and were so valuable that they were passed down in wills. Another form of skillet called a spider, shown on the left, has a flat bottom and straight shallow sides, a short handle, and 3 short legs. Short-handled frying pans didn’t come into use until stoves were invented. 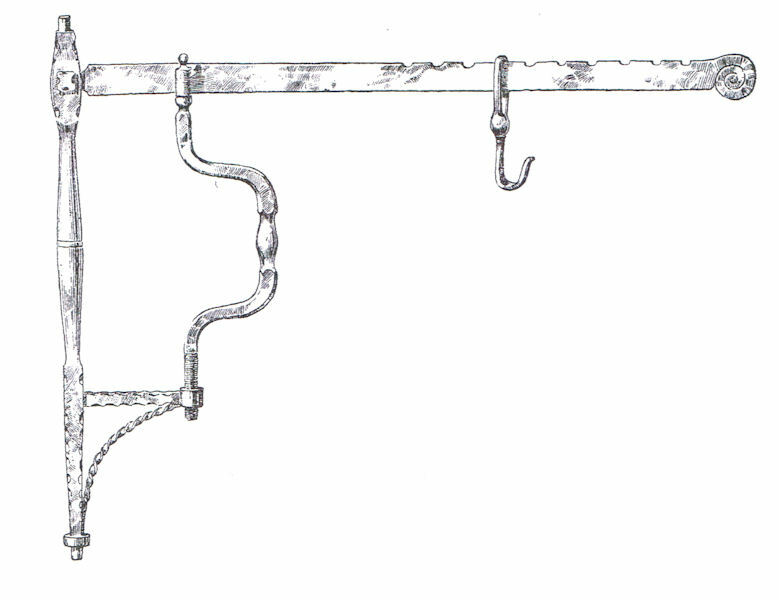 Eighteenth-century iron “fry pans” had a 3 foot long handle with hole at the tip for hanging when not in use. Trivets of assorted sizes were another necessity to hold kettles and footless pots and also serve as plate warmers. 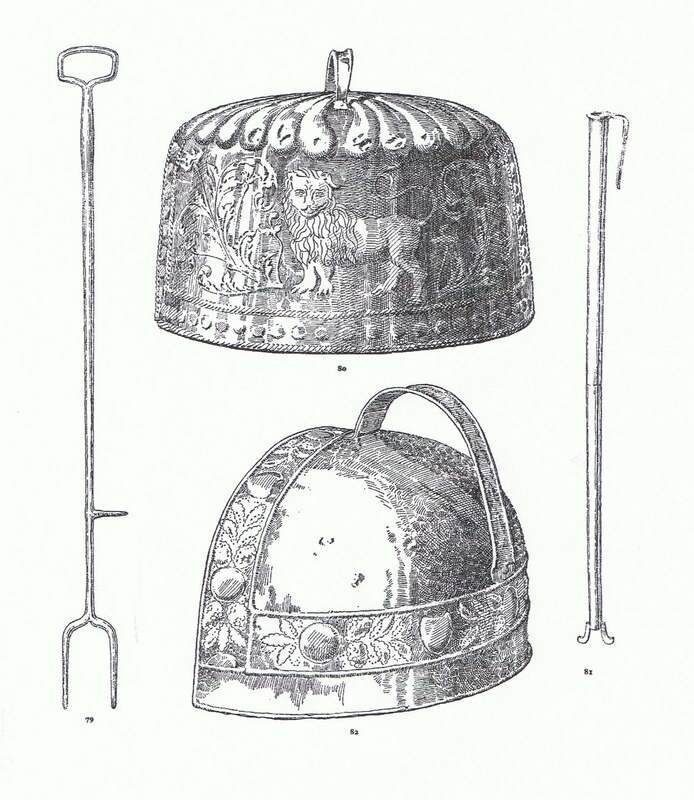 Gridirons were used for grilling fish or meat. They looked like 3-legged iron grills with a handle. A drip pan was placed beneath to catch the drippings. Griddles were made of iron and used to bake oat and buckwheat cakes. They were also used as toasters and were often made in delicate patterns. Wafer and waffle irons date from the 14th century and were used for church services long before they began to be used in the home. Then of course there were also many kinds of skimmers, spatulas, meat forks, and other tools made of wood, tin, or iron. 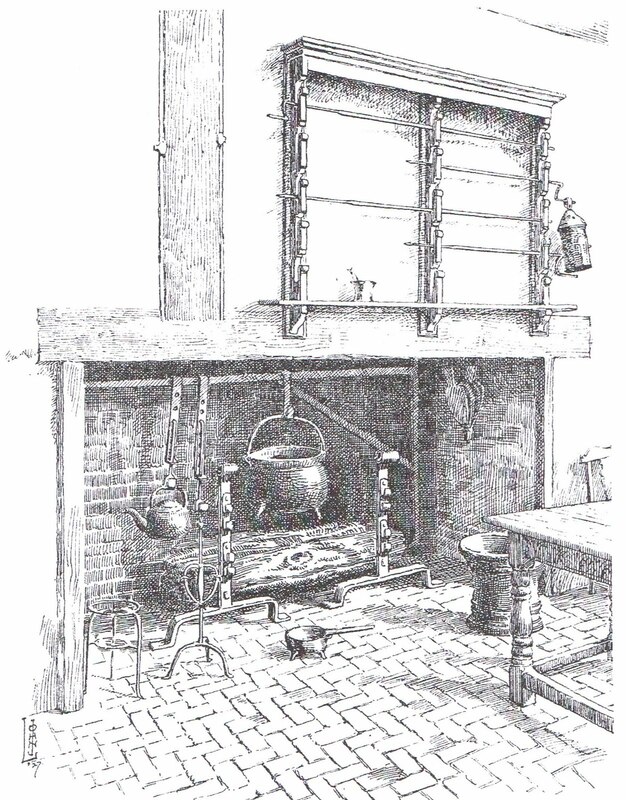 The sketch of the kitchen hearth at Mt. Vernon at right shows spit dogs, with a wooden spit rack on the wall above. Fowl and large pieces of meat were skewered on the spit, then placed on a pair of hooks turned by hand cranks while they roasted close to the fire. A more ingenious design connected the spit by a chain to an iron fan set in the flue. The draft passing up the chimney turned the fan, which pulled the chain and turned the spit. 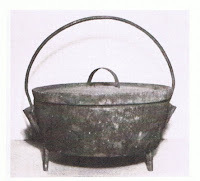 Many of us are familiar with the iron baking kettle, shown at left, commonly called a dutch oven. The kettle is set into hot coals and ashes, and more coals are piled on its flat lid to bake the contents evenly. 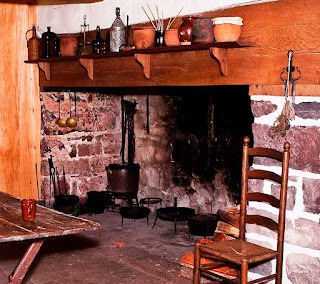 However, check out this post on the Historic Cookery blog by Carolina Capehart, a culinary historian, hearth cook, and former Conner Prairie interpreter. 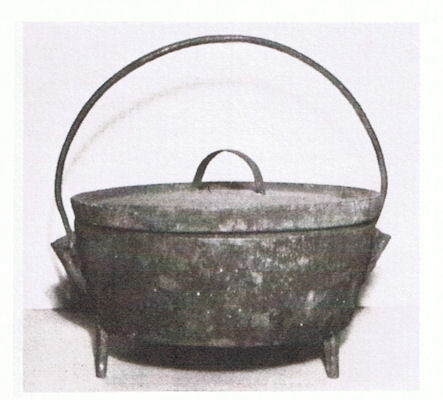 She offers definitive evidence that a true dutch oven is, in fact, a tin reflector oven, also called a roasting kitchen or hastener, while the cast iron pot described above is correctly called a bake kettle. 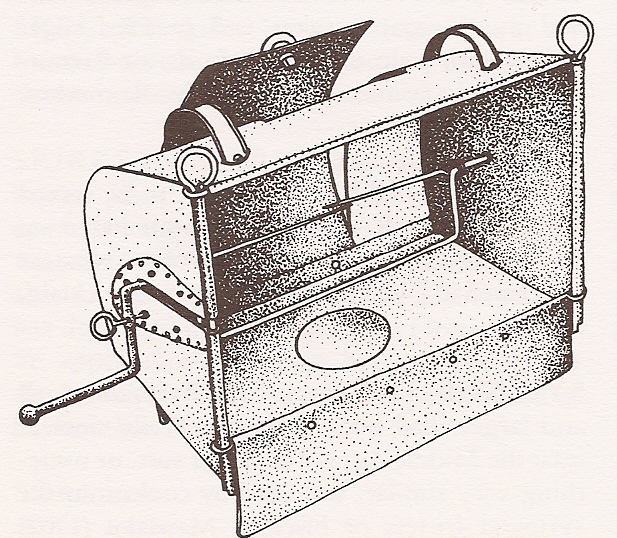 Reflector or dutch ovens, shown at right, could be from 1 foot to 4 feet long and were made of tinplate, which reflected the fire’s heat, reducing cooking time and saving fuel. The meat was impaled on a spit that ran through the oven and was turned with a hand crank at one end. There was a door in the back so the cook could check the meat and baste it while it roasted. Meat juices were collected in the curved bottom, and there was a spout at one end to pour them off when the meat was done. 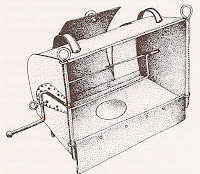 Reflector ovens were used for baking biscuits as well, and there were even specialized roasters for birds and apples. Fireplaces also often had ovens built into the back wall or on one side of the fireplace opening, as you can see in the picture at left. Constructed in a beehive shape with a domed roof and a separate flue, these sometimes had a small opening underneath that served as a warming oven. When the bricks were hot enough for baking, the ashes were raked out, oak or cabbage leaves might be laid on the oven’s floor in absence of the baking pans we use today, and the loaves were slid inside using a peel. Some designs featured an ash oven where the fire was built, with the heat rising through a vent into the bake oven above. This type cooled off more rapidly since the bricks didn’t get as hot. At first ovens had wooden doors, which, as you can imagine, tended to get seriously charred even if they were lined with tin as some were. By the 1800s hinged cast iron doors were becoming commonplace—understandably so! Pewter and other metals, like silver, were too expensive for most colonists to afford, so variety of carved wooden ware, including knife boxes and spoon racks, helped the cook keep her kitchen organized. 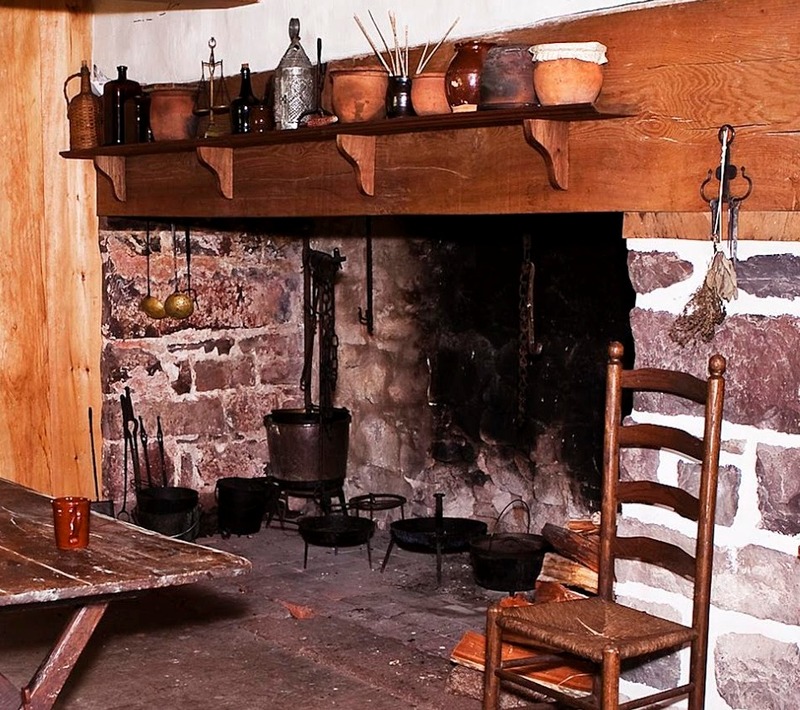 Almost all colonial kitchens had a salt box, generally kept near the fireplace, where the cooking was done and where the salt would be kept dry. The earliest knife boxes look like salt boxes, only deeper. 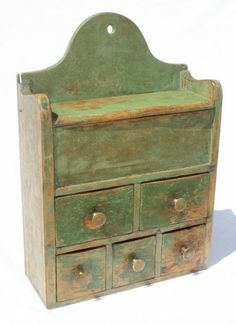 Spice boxes usually had several drawers. Candles boxes had sliding wooden lids and either sat on a table or hung on the wall to keep the tallow candles from being eaten by vermin. According to Kitchen Antiques by Mary Norwalk, “Pieces of cutlery were precious possessions and in order to keep them clean and dry they were stored near the fire. Spoons, knives, and carving forks were placed in racks attached to the wall with a small drawer underneath the rack, and this was used for spices and seasoning, or precious pieces of small equipment.” Most wooden items were made by the homeowner, and beautifully constructed wall boxes were proudly displayed as decorative items. It’s amazing to consider all the gadgets that existed back in the 1700s to make the housewife’s life easier. Even so, they definitely had a lot of back-breaking work to fill each day. What aspects of the colonial housewife’s life do you think you’d find the most enjoyable, and which ones the most unpleasant? J. M. Hochstetler is the daughter of Mennonite farmers and a lifelong student of history. She is also an author, editor, and publisher. 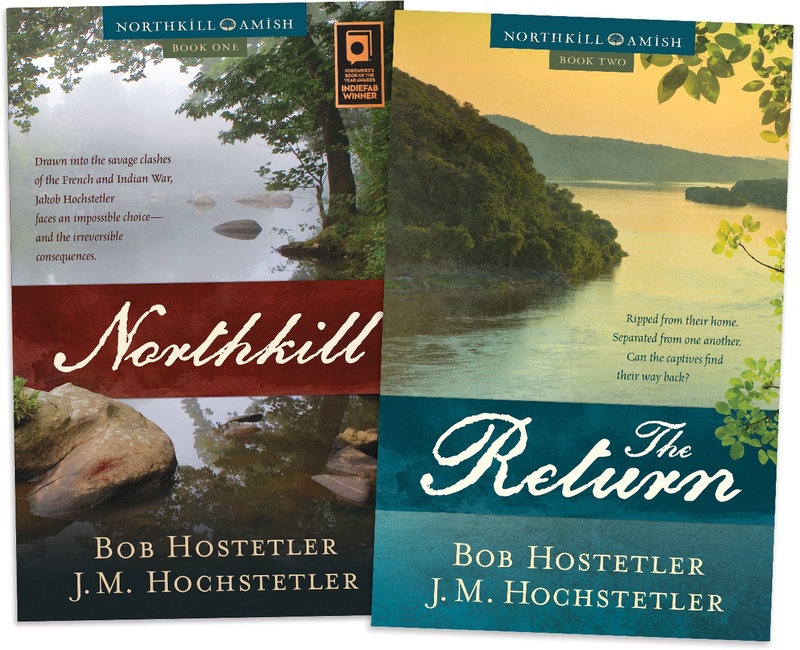 Northkill, Book 1 of the Northkill Amish Series coauthored with Bob Hostetler, won Foreword Magazine’s 2014 INDYFAB Book of the Year Bronze Award for historical fiction. Book 2, The Return, releases April 1, 2017. 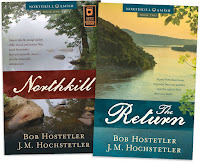 Her American Patriot Series is the only comprehensive historical fiction series on the American Revolution. One Holy Night, a contemporary retelling of the Christmas story, won the Christian Small Publishers 2009 Book of the Year Award. I do too, Melissa! Just like we do today, they must have felt very "modern" back then to have all these conveniences. It's such fun to see what their daily lives must have been like. Some of these descriptions are just want I needed. I'm working on the 2nd book in a series set in 1790s Natchez and the hero (blacksmith) repairs the fireplace crane for the heroine. Except in the first draft, I called it that "hooky thing" or something like that until I could do some research. This post is golden!!! Pam, ye're sae welcome, lassie! My pleasure. Seriously, I'm always looking for these kinds of details for my novels too, and I'm glad I was able to supply what you needed! I didn't know that about the dutch oven and the bake kettle. That is so neat! We love to cook with our cast iron and use it most every day. I didn't know about that either, Joy, and I found that very interesting. I know a lot of folks who love their cast iron. You have to know how to use and maintain it to keep it from getting rusty. It's too heavy for me to handle, so I'm glad for my lighter weight cookware. Great and informative post! Thank you! You're so welcome, Connie! I love to research how they did things in the olden days. lol! This was really interesting!I like reading how they adapted to the area/environment around them.I often wish that there was some type of place where an individual could go and live like how they lived in the past for a certain period of time.I would glady go spend a week or more living like our ancestors did. Great Article! Grace, a few years ago there was a series on TV--can't remember which station, but maybe PBS--where they did just that. It was really interesting, and most of the participants found it really hard going. We have no idea what our ancestors had to endure day to day. We sure are pampered today! Having grown up with an antique loving mother, I'm familiar with a lot of these items. We visited a lot of places in Pennsylvania, Virginia, Maryland when I was a kid. I love old things. I regret selling a round spice box with smaller boxes inside , some with spices still in them,. We had to downsize when we moved twenty years ago. But I still have a few antiques thanks to my mother who turned 100 in January. She was also a dealer for a while. Love these lessons in history! Paula, I love antiques, too, and often go on the prowl with one of my cousins, who's an even more avid antiques shopper. I just learning about how people lived in previous eras. I'm so sorry you got rid of your spice box! I know about downsizing, and it's hard to let go of treasures. I hadn't heard about having several small fires before, but it does make sense. I've seen some of the 18th century homes and wondered why the fireplaces were so big. Now it makes sense. I have an old spice cabinet, but I've no idea what the age is. I found the use of small fires very interesting too, Vickie, and like you say, it does make sense. You really can't cook over a roaring fire, and having several small ones allows you to cook different dishes at different temperatures. I just love learning details like that! Thanks for sharing such interesting information Joan. I love learning about all the "modern" gadgets of that era. I am sure it was back-breaking work. Me too, Mrs. Tina! And, yes, I don't know whether we pampered folks from today could have survived back then. Just thinking about the amount of work they had to do gives me the vapors. lol! Thank you for sharing this informative post, Joan. Our heritage and all they endured is hard to imagine with all the extra work in the kitchen compared today. Marilyn, you are so right about the work load our ancestors had to endure. They were made of sturdy stuff. It gives me a new appreciation for all our conveniences, that's for sure!